Alright, you've got the best cowboy costume this side of the Mississippi (maybe both sides.) You've got the guns in their holsters (the other two in the shirt sleeves), the hat tilted forward just right and the spurs jangling perfectly. There's just one problem that you notice as you step out the door. You can't keep your darn pants up? You hobble back into the house holding your pants up and sit down thinking to yourself "What could I have possibly forgotten?" Don't fret too much. We've totally been there. 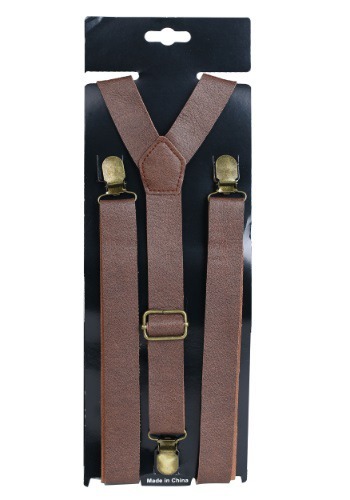 Just make like the real cowboys back in the day and put on some fantastic suspenders. These faux leather ones will blend in fantastically with your costume and even add an extra enduring toughness look to it! Not to mention it will actually hold your pants up long enough to show off how fast your draw is. Our fastest guy in the office can sketch an entire face in fifteen seconds.